Skip over the results to the report. On a very warm muggy day we were delighted to welcome five new runners, Sue and Colin Sheath, Ted Hawke, Min Spooner and Mike Stead. 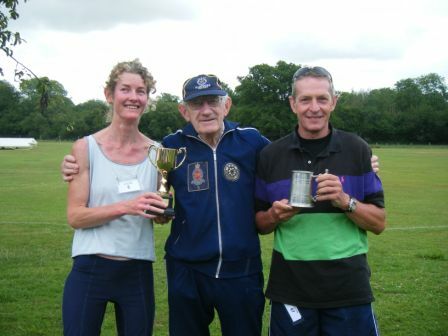 Min, Sue and Colin were first, second and third home but as this was their first time the cups for most improved runners were awarded to Alice Evans and Andrew Gibson. Well done both! Thanks go to Ben, Katy and Emma Evans assisted by Jonathan for marshalling, Simeon and Jonathan Evans for photographs and Emma Smith for the refreshments, Fiona and David for putting out the signs and the Cricket Club for the venue.